Each month, the Dwellings Talk Series invites you to join a conversation about the idea of "dwellings" from three distinct perspectives: urban ecology, youth homelessness, and urban design. Engage in this knowledge exchange with the rest of our community and join the conversation after the talk. 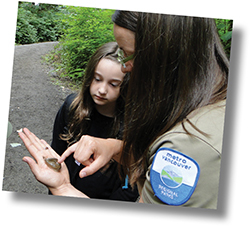 On November 8, meet Metro Vancouver Regional Park Interpreter, Zoey Slater, as we explore Wildlife in the City. Regional Parks preserve habitat close to urban areas for both wildlife conservation and the health and happiness of our urban population. Investigate urban wildlife with a Metro Vancouver Regional Park Interpreter. Open your eyes to the seen and unseen wildlife co-existing with us. What elements do they require? How have they adapted, expanded with us, or been excluded? Why is exposure to wildlife and the proximity of functional ecosystems so important to an urban population? Everyone is invited! Admission is free! Learn more about the Dwellings exhibition at the ArtStarts Gallery.